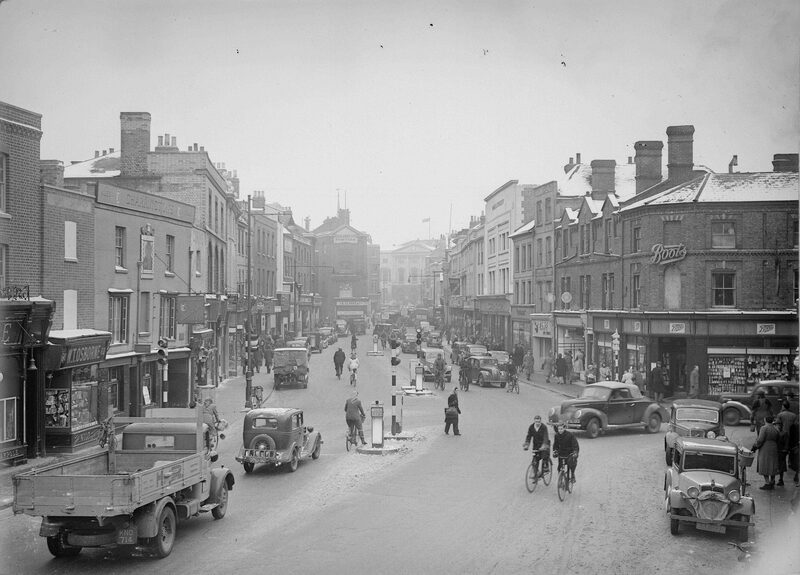 In the seventh post in our series looking at the history of Chelmsford High Street, Ashleigh Hudson looks at no. 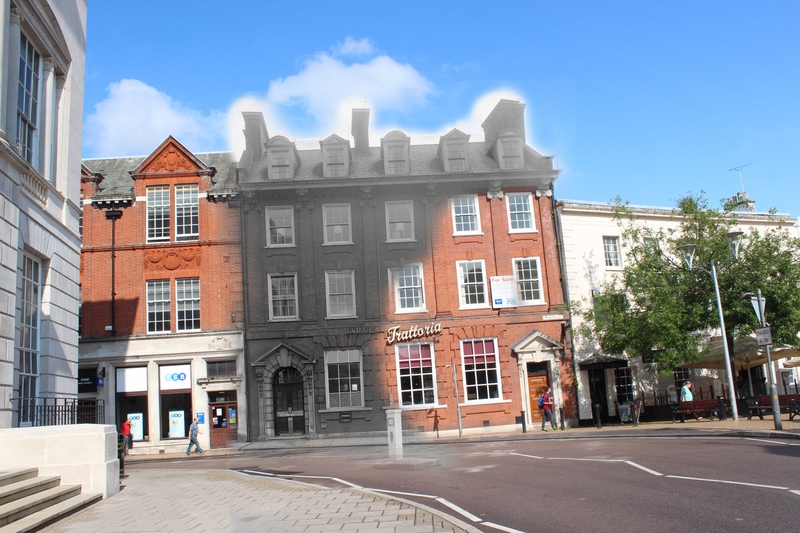 58 High Street through the centuries. 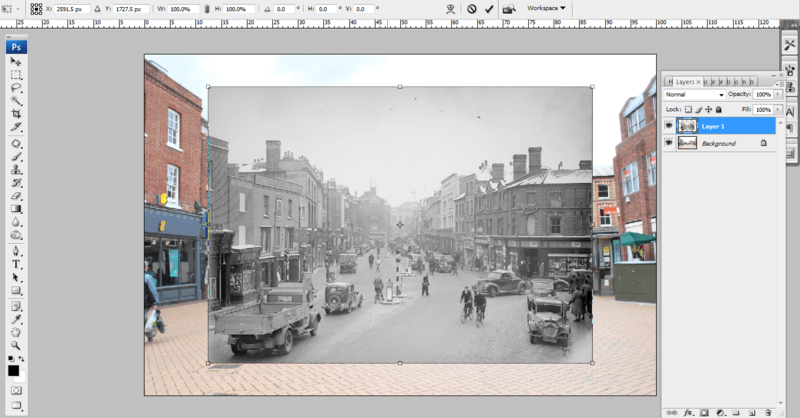 Find out more about the project here. No. 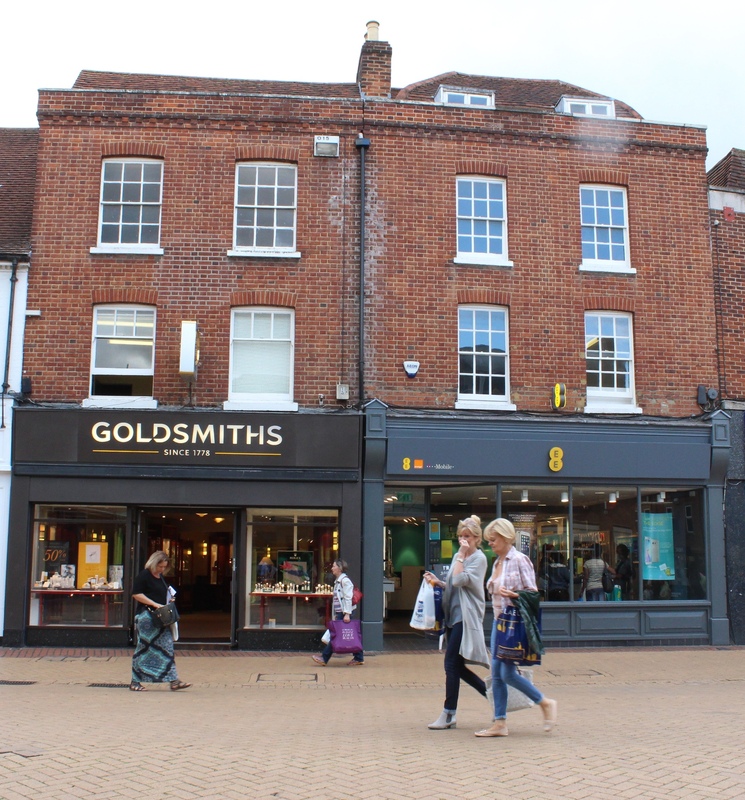 58 Chelmsford High Street is today occupied by the jewellers, Goldsmiths. 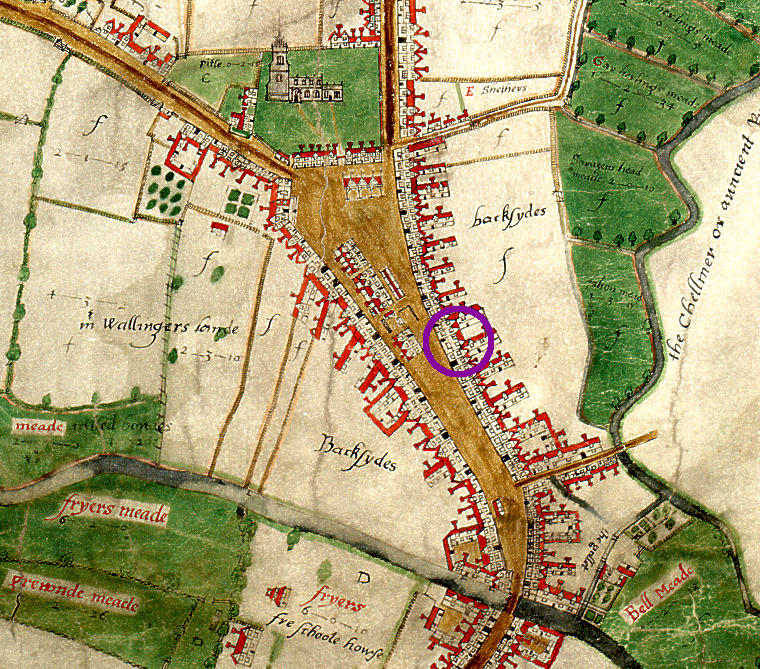 John Walker’s 1591 map of Chelmsford identifies a small property named Felsteds on this site. 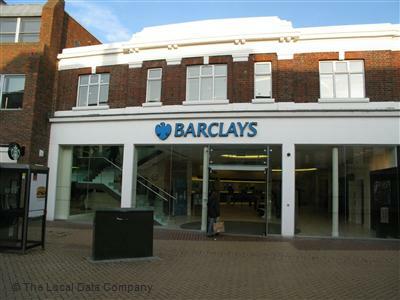 The shop took its name from Henry of Felsted and his son Robert, who purchased the shop in the early 14th century. 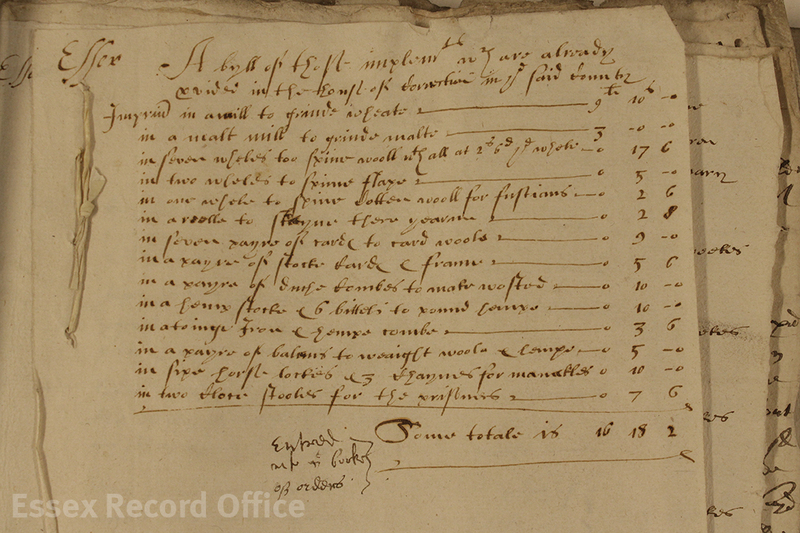 By the time Walker made his survey the shop was owned by Thomas Hawes. Felsteds was one of the smallest properties fronting the west side of the high street and was recorded as having only 2 hearths in the 17th century. 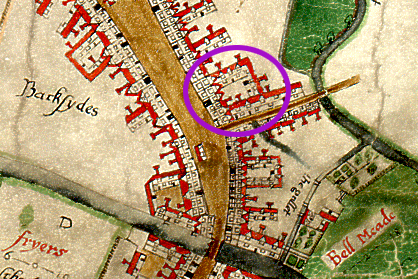 By 1708 the property was occupied by a musician, James Wright. 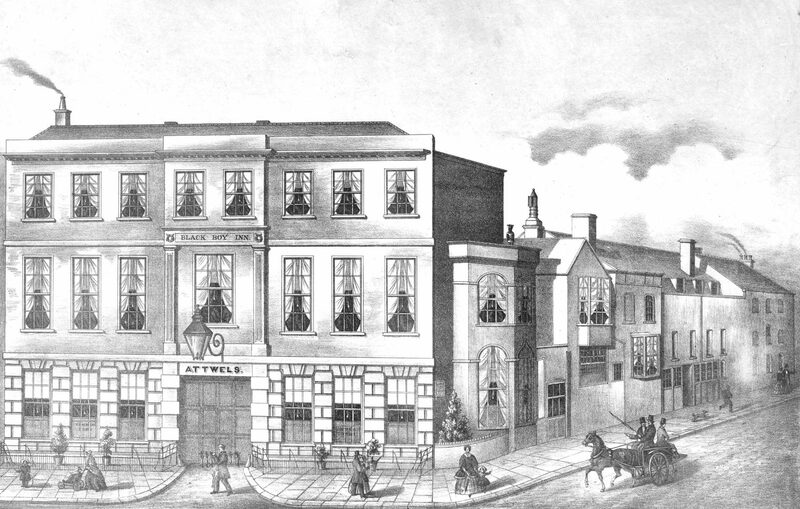 Wright’s will bequeathed a range of musical instruments, bows and strings to his granddaughters, Ann and Lettice Wyatt. 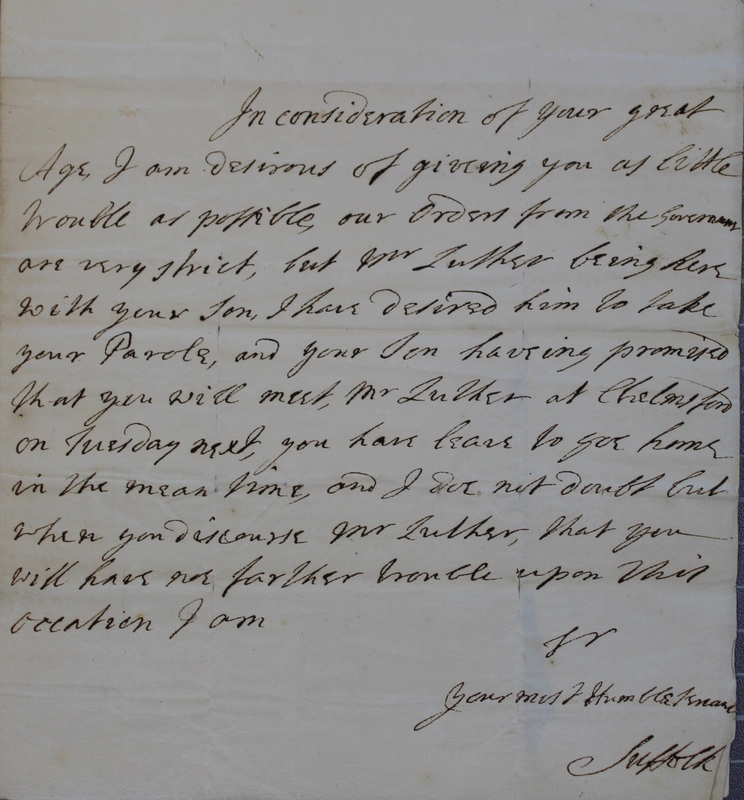 Wills are a fantastic source of information which can tell us a great deal about the person who wrote it, particularly in terms of family relations. Wills give a good indication of an individual’s personal wealth, but they can also reveal the items and possessions individuals valued. One would imagine that as a musician, James Wright would have highly valued his collection of instruments. 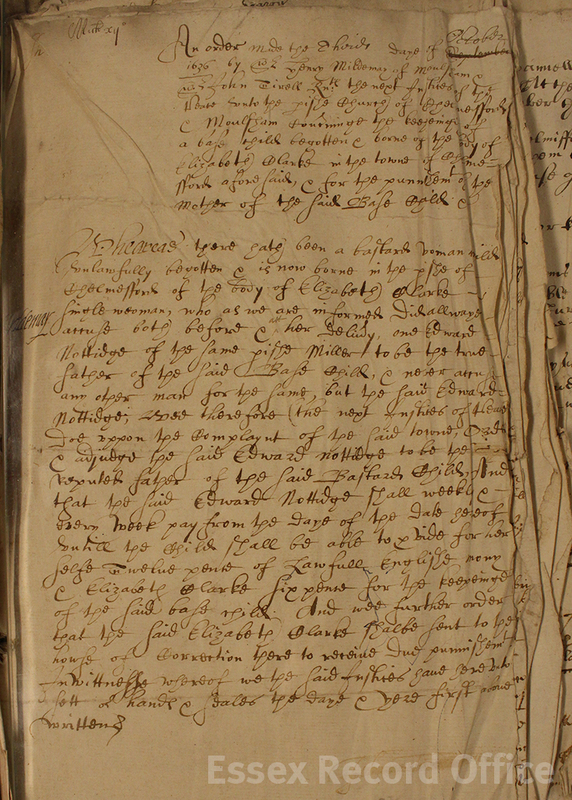 Wills also provide evidence of property ownership. 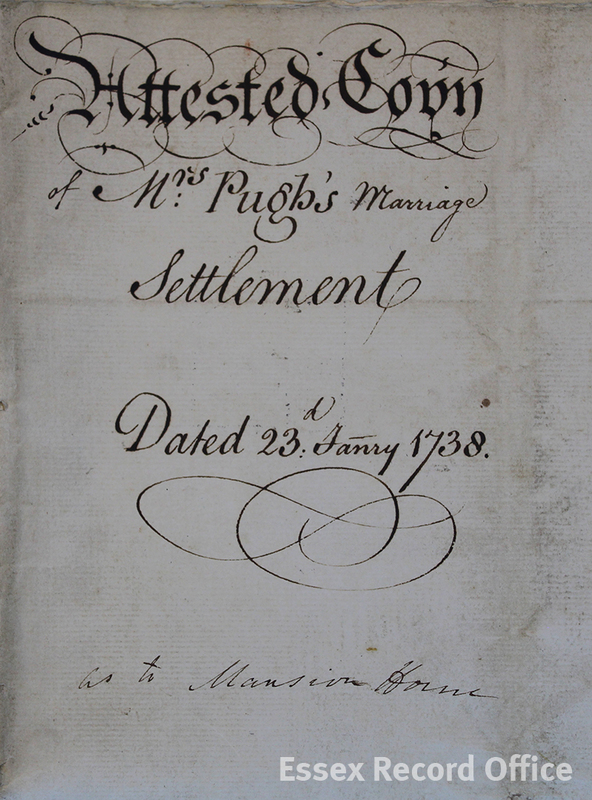 From 1841 the property was occupied by veterinary surgeon Samuel Baker and his family and we know from Baker’s will that after his death the property passed to his wife, Caroline Baker. 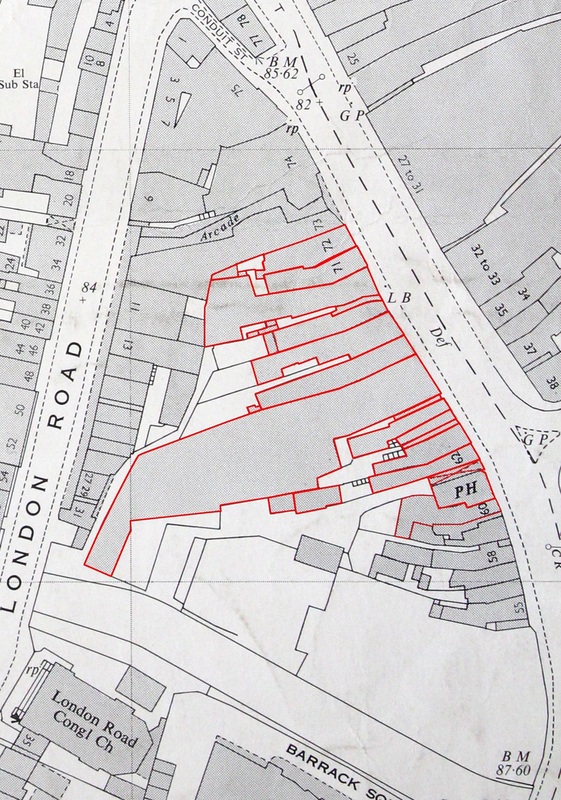 The property stayed in the Baker family into the 20th century. 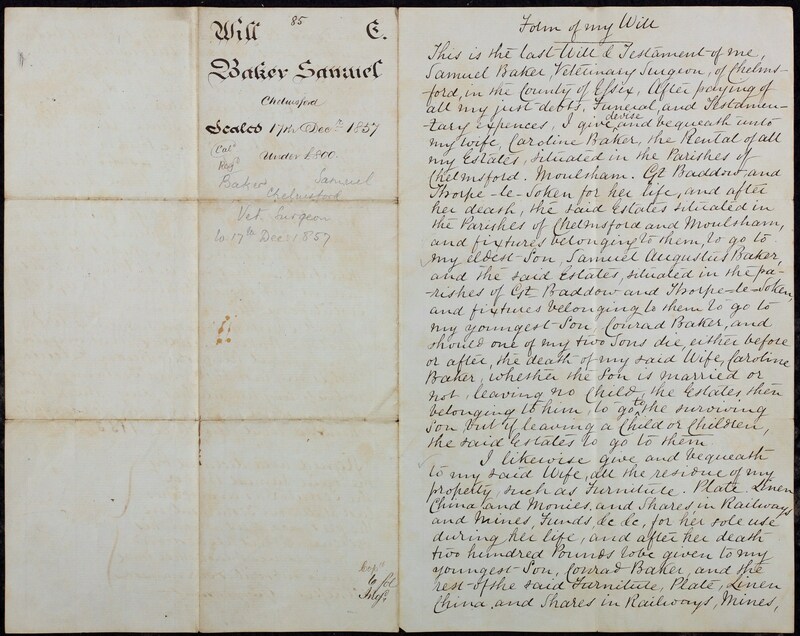 The will of veterinary surgeon, Samuel Baker, 1857. 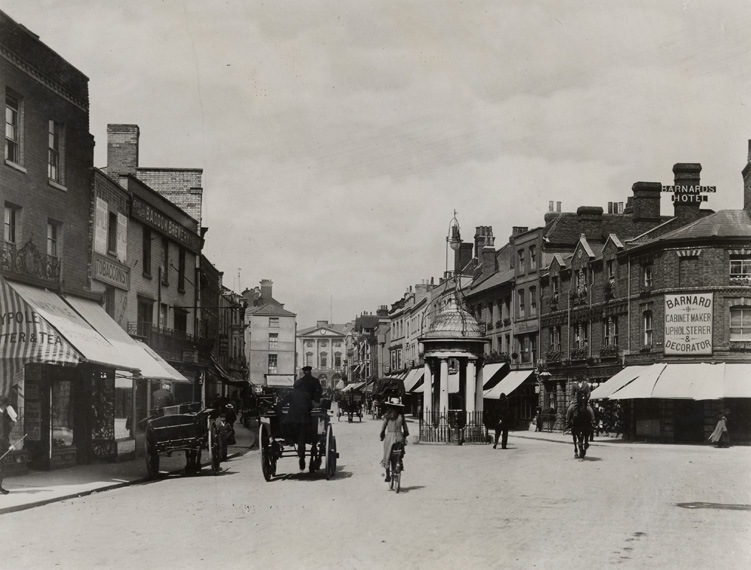 Throughout most of the 20th century, the site housed various jewellers. 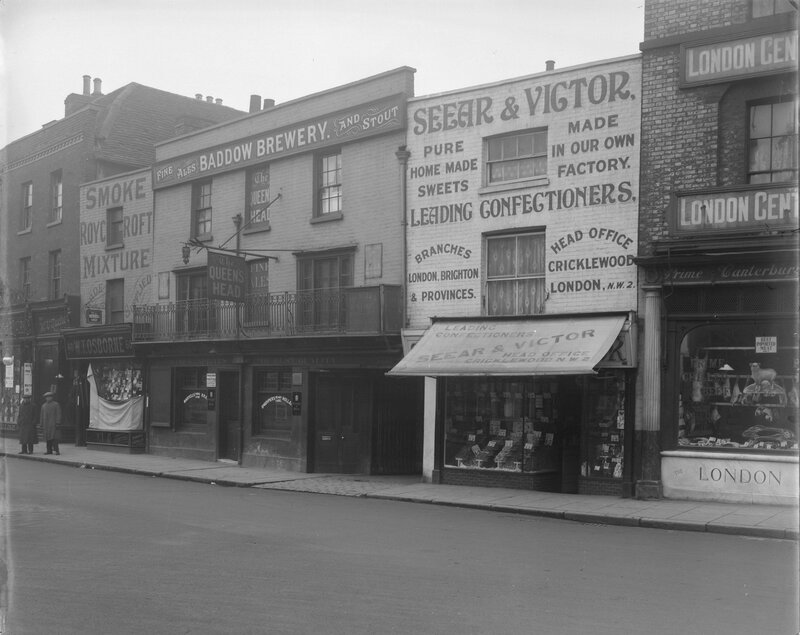 From 1922, the jeweller Oram and Sons occupied the site and continued to do so until the 1940s when the store came under the ownership of W.G Webber. 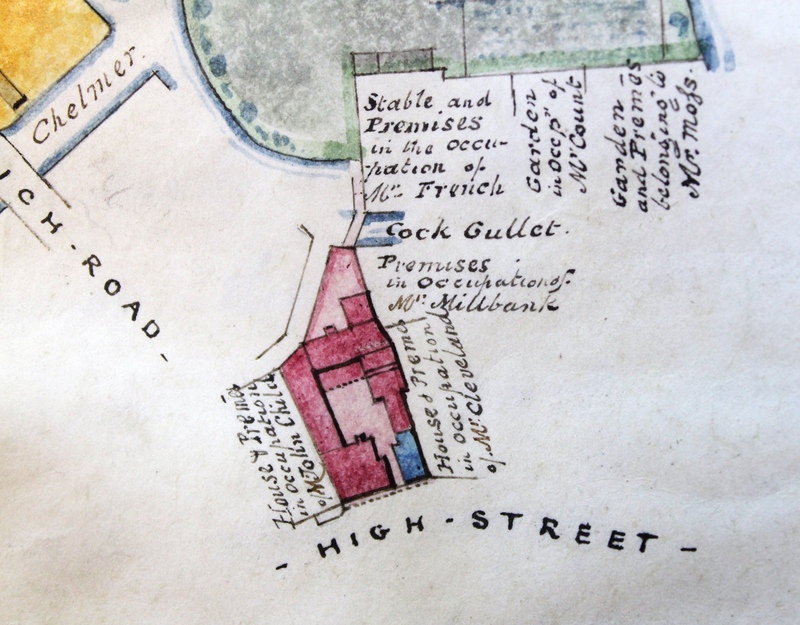 This continuity has continued to the present day, with the jewellery chain Goldsmiths occupying the site today. 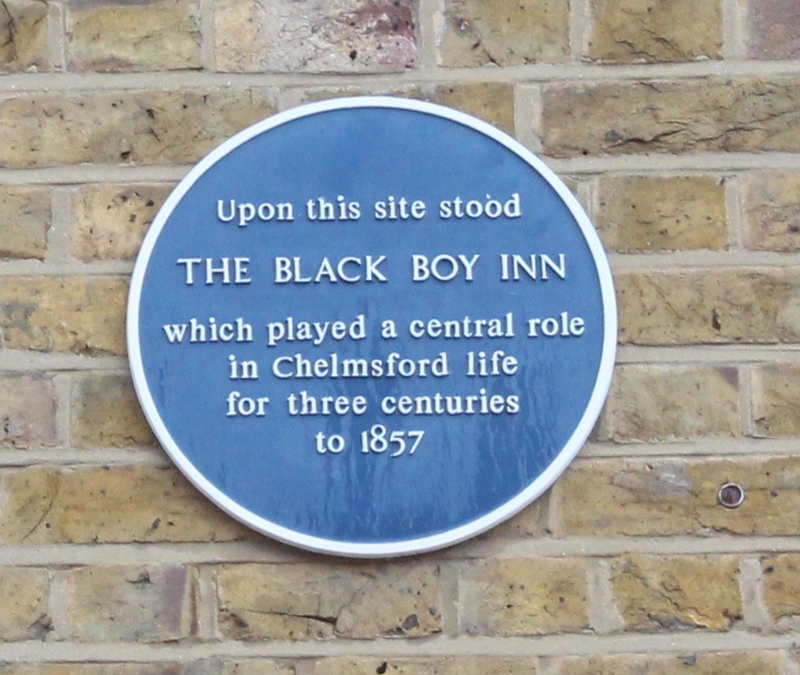 If you would like to find out more about this property, see Hilda Grieves’ detailed history of Chelmsford, The Sleepers and The Shadows. 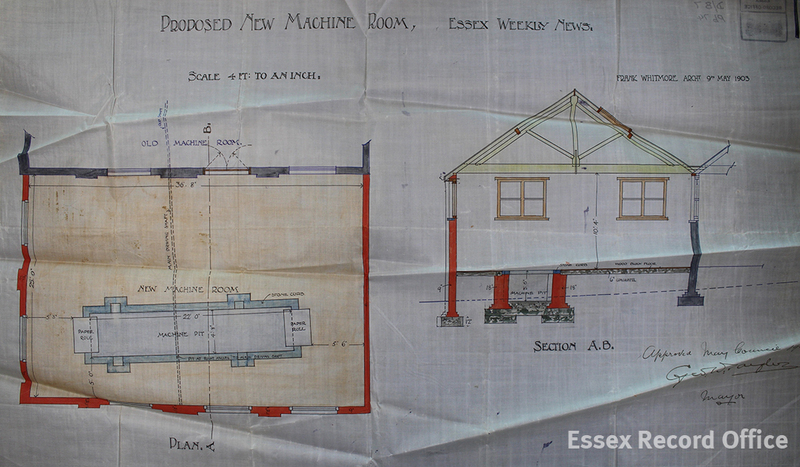 The Essex Record Office has a fantastic collection of wills, many of which have been digitised and can be accessed through Essex Archives Online. 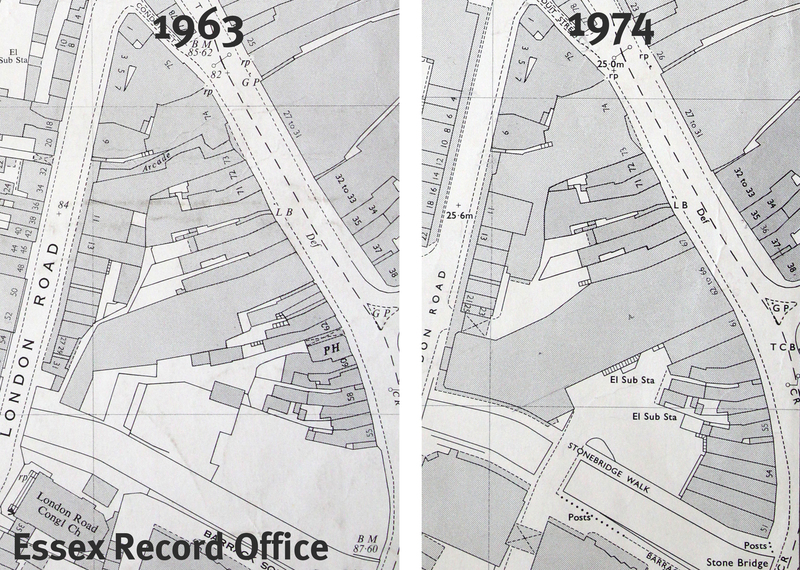 Information compiled from the research and report produced by ERO Archive Assistant, Sarah Ensor. 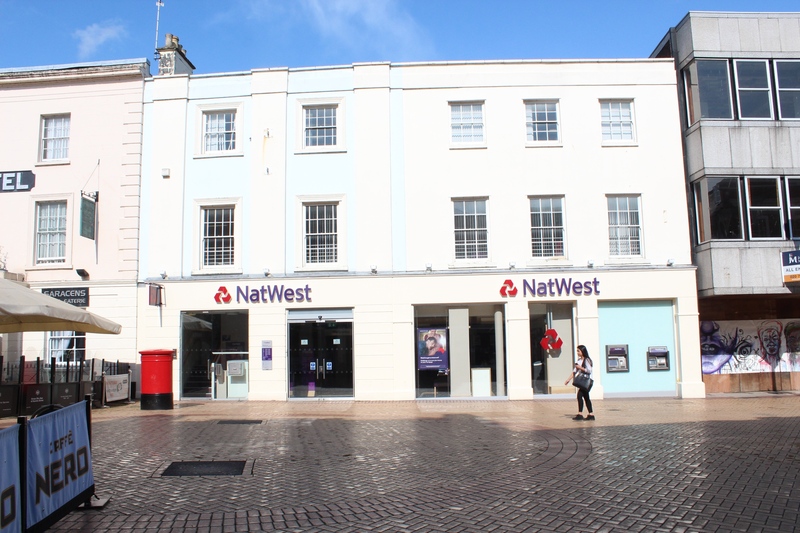 In the fourth post in our series looking at the history of Chelmsford High Street, Ashleigh Hudson looks at nos. 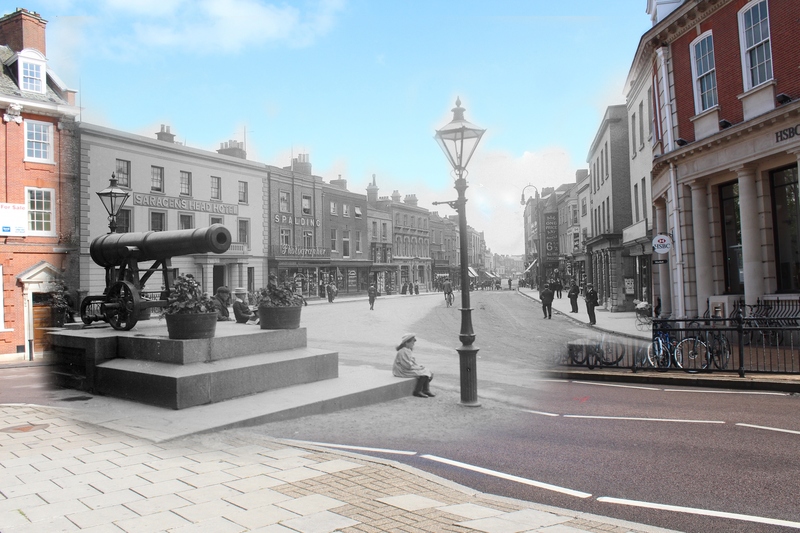 28-31 High Street through the centuries. 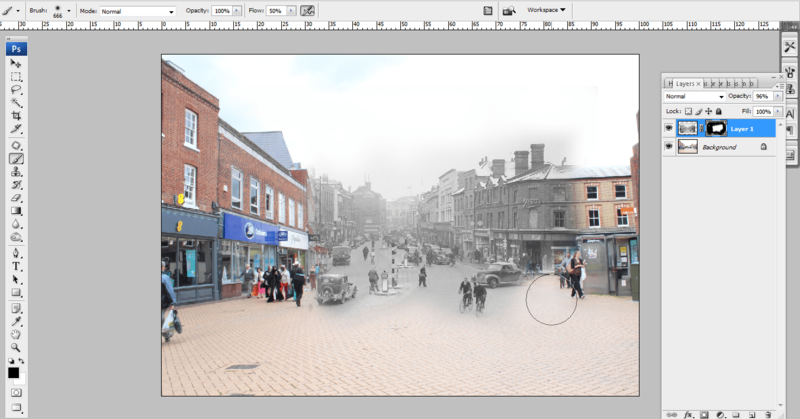 Find out more about the project here. 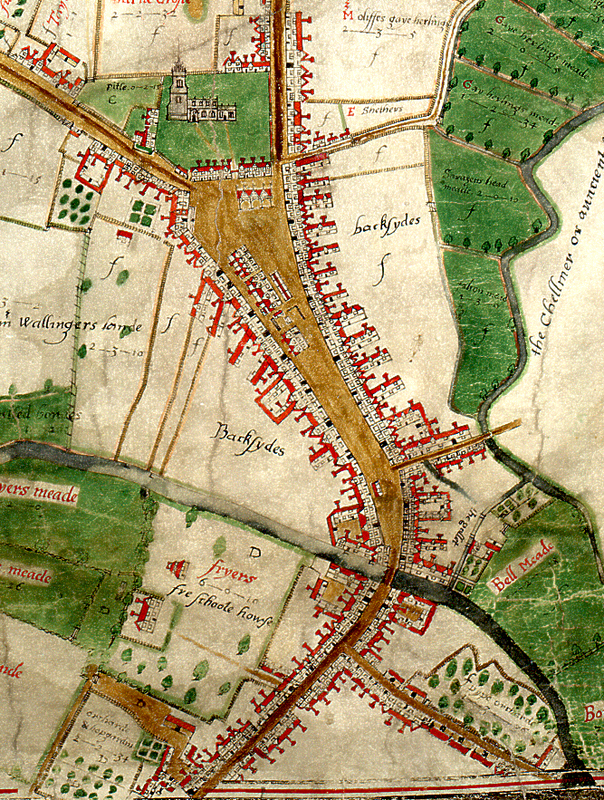 By 1591 there were 11 major inns in the town, including the Falcon. 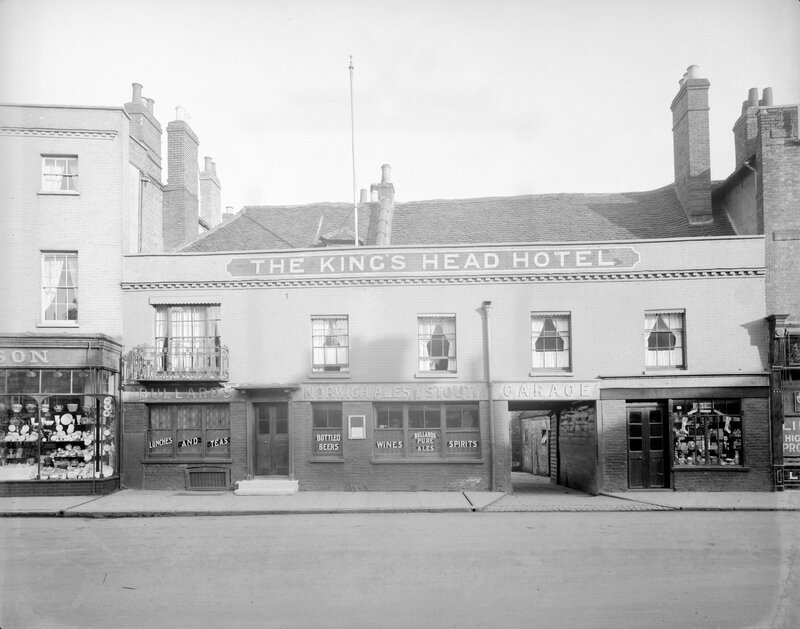 Innkeepers were supposed to be licensed, but the town authorities frequently dealt with people who had been selling ale unlicensed or running brothels. 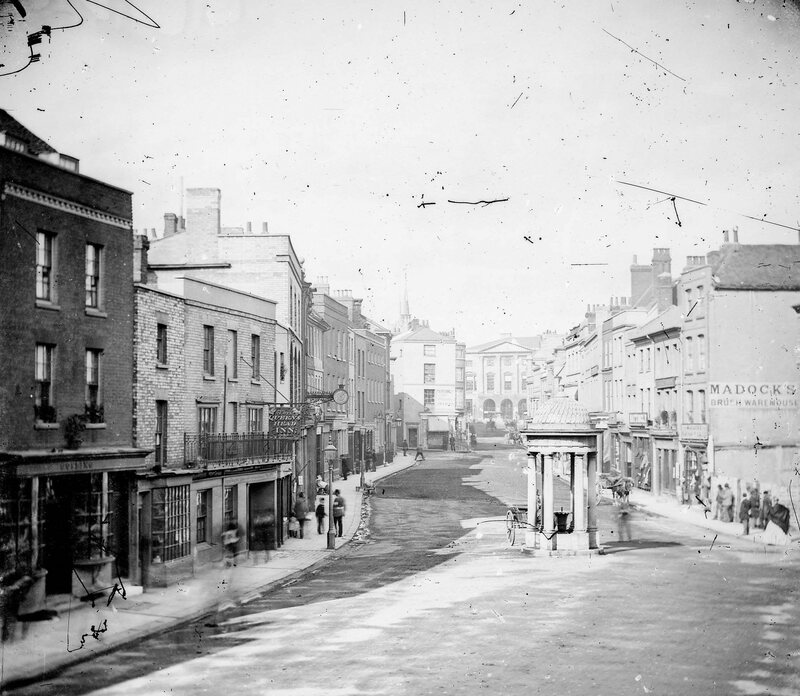 The Falcon was a mid-sized inn which survived on the site until the early 18th century when it was pulled down and replaced with three attractive brick houses. 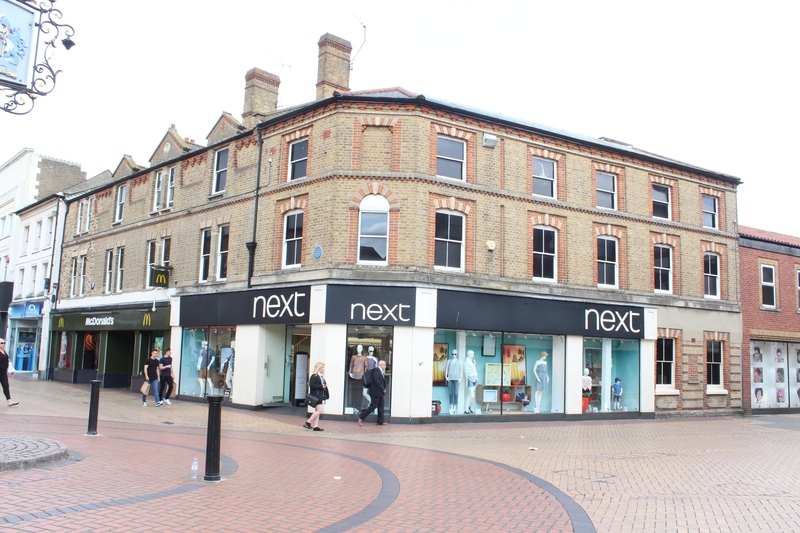 The properties were built to serve as private dwellings but they increasingly adopted a dual purpose, providing both a retail and residential space for the growing town’s entrepreneurs. 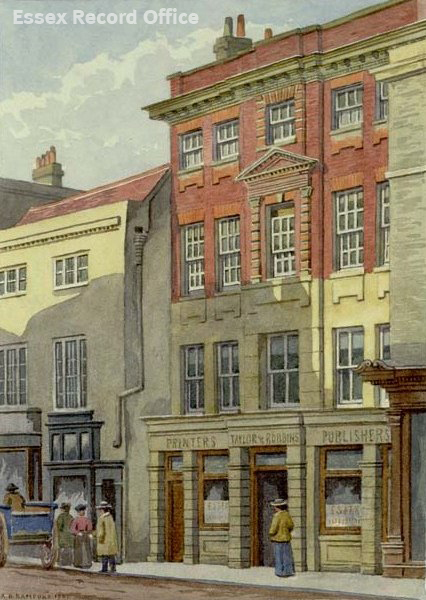 At the north end of the site Robert Serjeant ran a newfangled Coffee House. 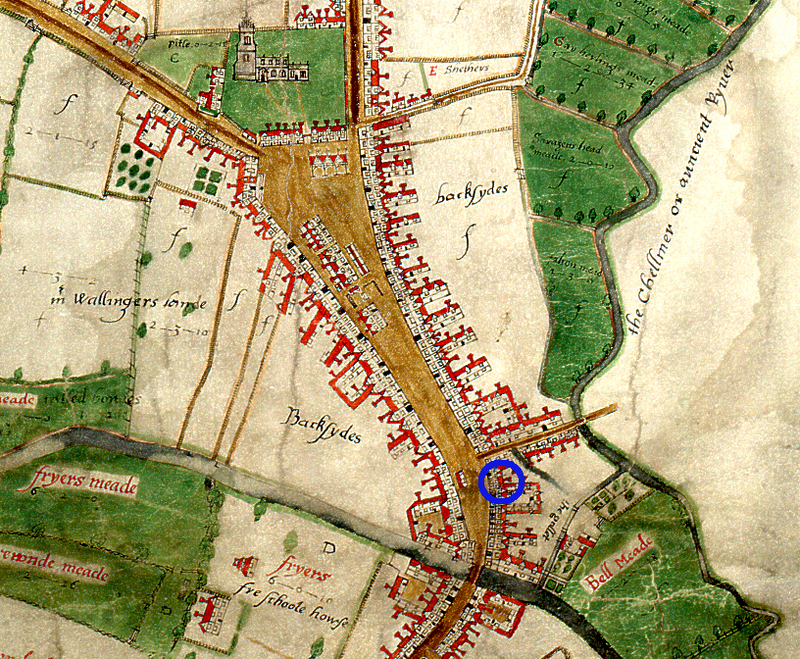 In 1787 number 28 was occupied by Andrew Smith who ran a successful linendrapery. 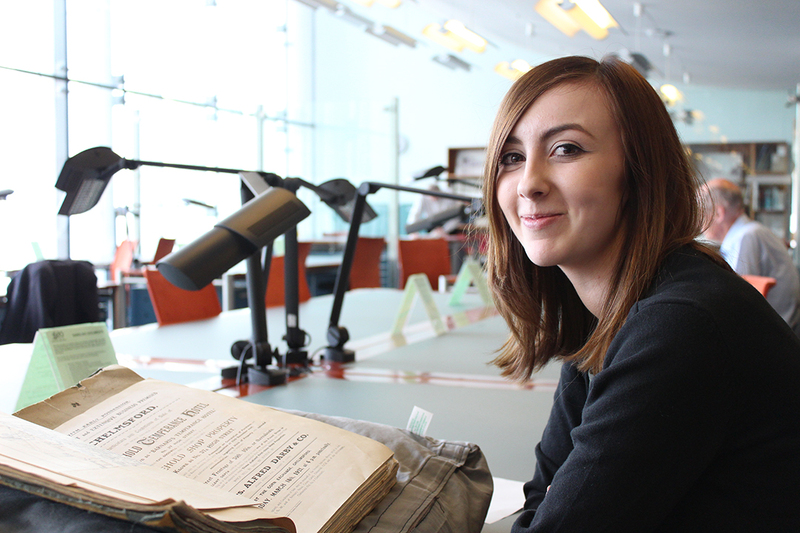 Apprentice records reveal that Smith was able to employ various young, female apprentices between 1790 and 1802 to assist with running his thriving business. 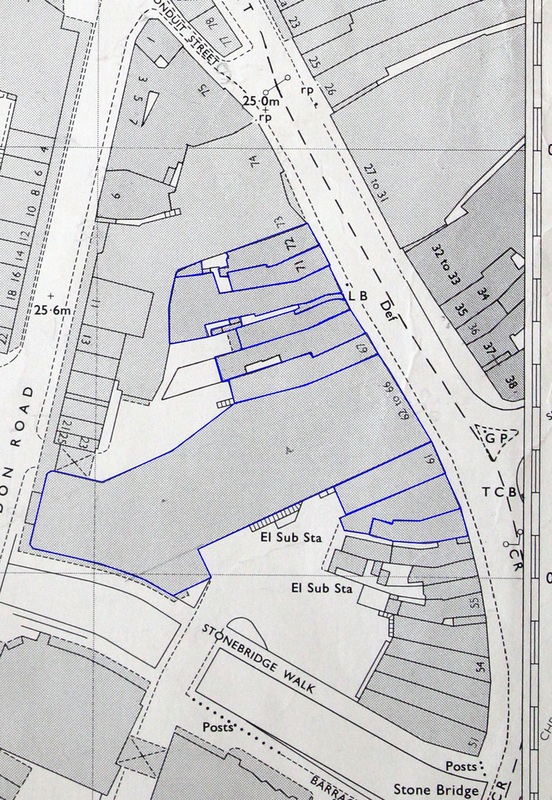 For a few decades the development of these properties occurred sporadically according to the needs and means of particular owners. 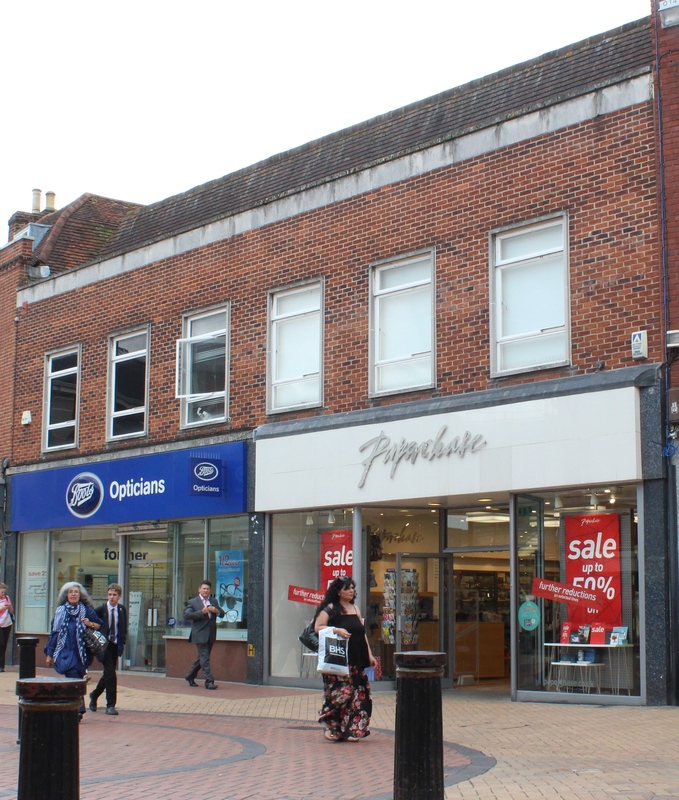 In 1870, however, J.G Bond, owner of a drapers shop in Moulsham Street, moved to the prime site of 28 and 29 High Street. 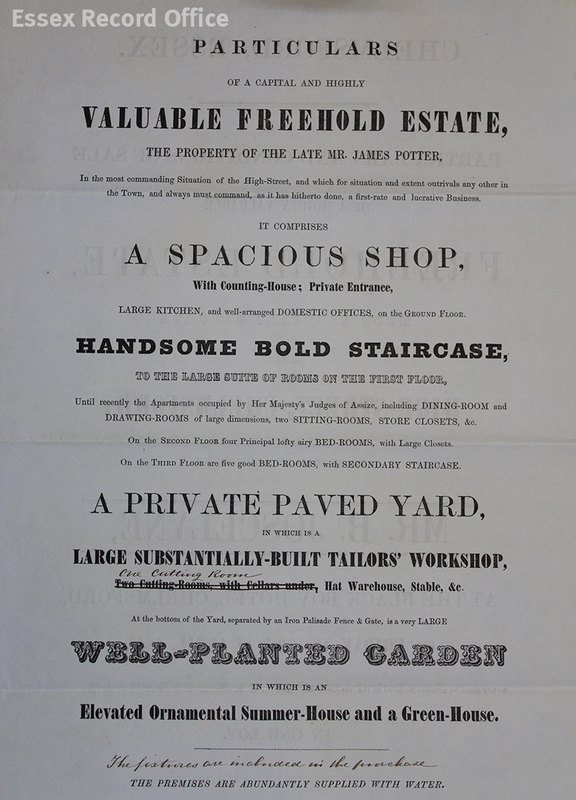 Several months after opening, Bond placed an advertisement in the Chelmsford Chronicle boasting of an enlarged shop and new show rooms. 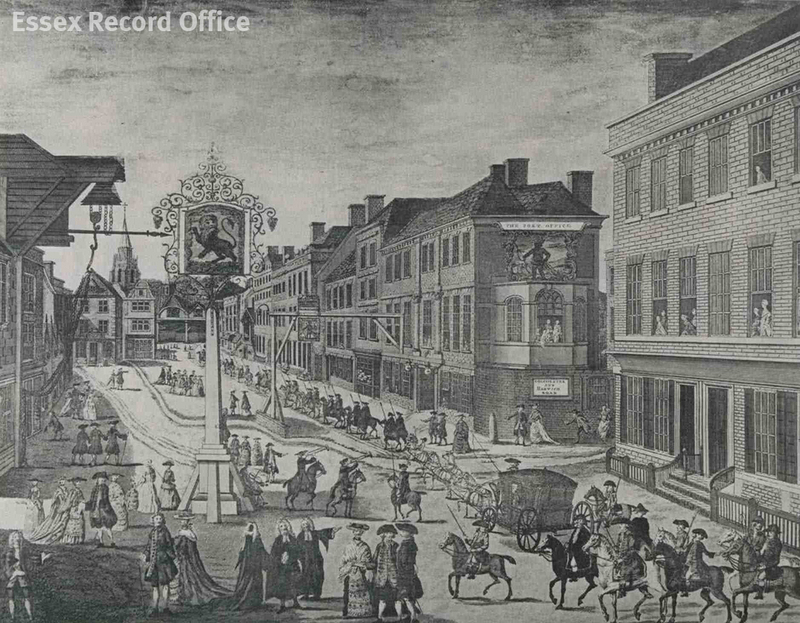 Advertisement featured in the Chelmsford Chronicle shortly after Bond’s opened on the High Street. 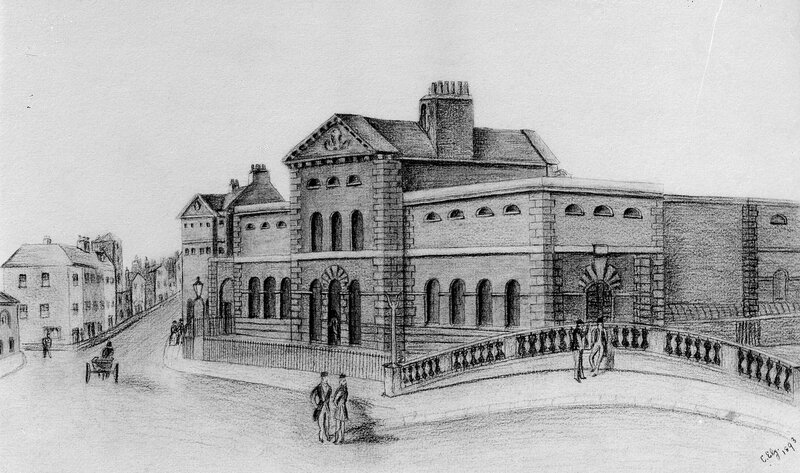 The ambitious Bond had a keen eye for development and in 1881 submitted plans to construct a bridge connecting the upper floors of 28 and 29 as well as plans to redevelop all of the outbuildings. 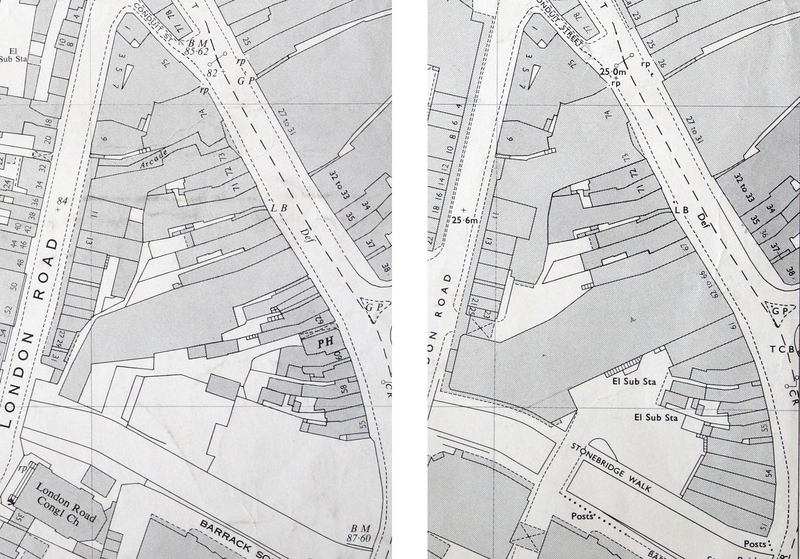 By 1902, Bond had absorbed Saltmarsh’s store (no. 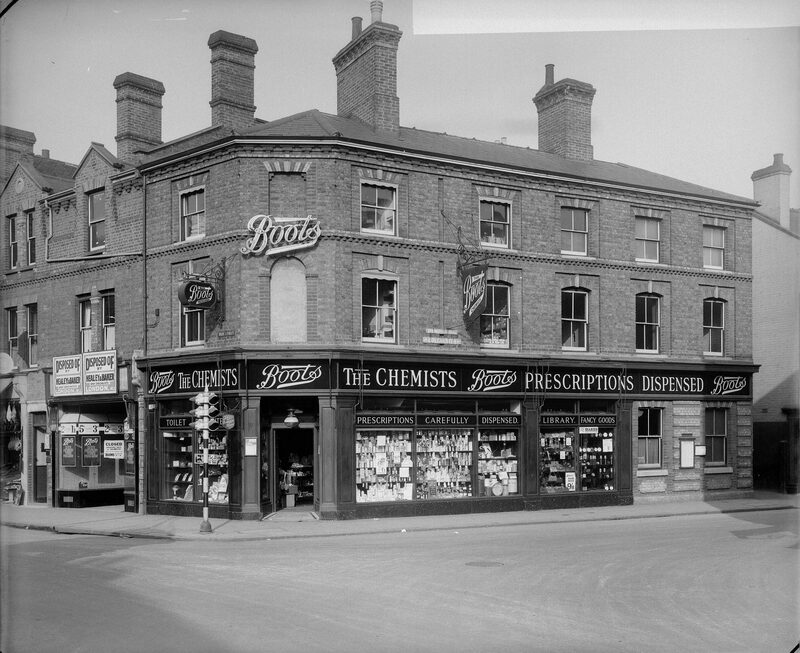 30), as well as Edward Wills’ Draper shop (no.31) and finally the chemist owned by Wilson Metcalf (no.27). 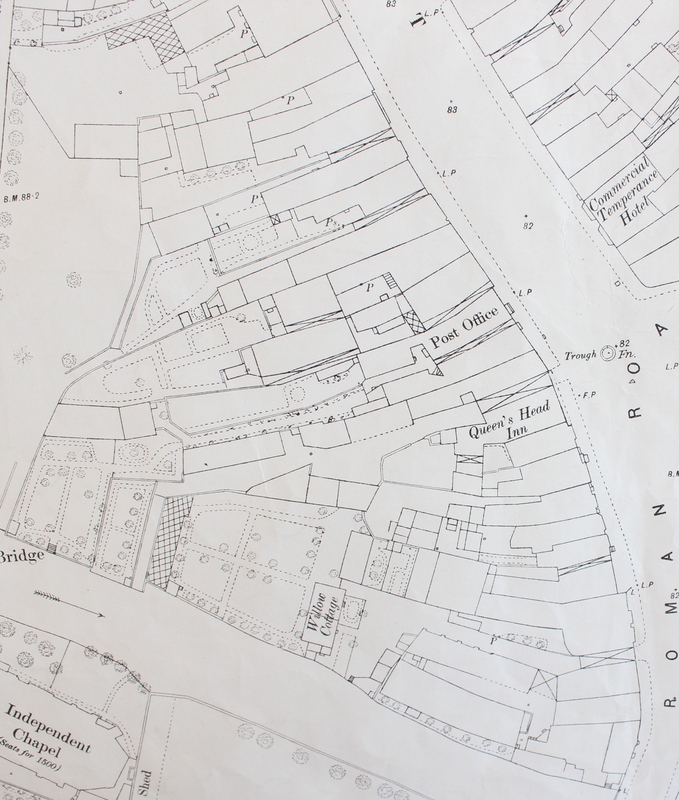 The 1911 Census reveals that Bond employed 24 members of staff, mostly from the Chelmsford area. 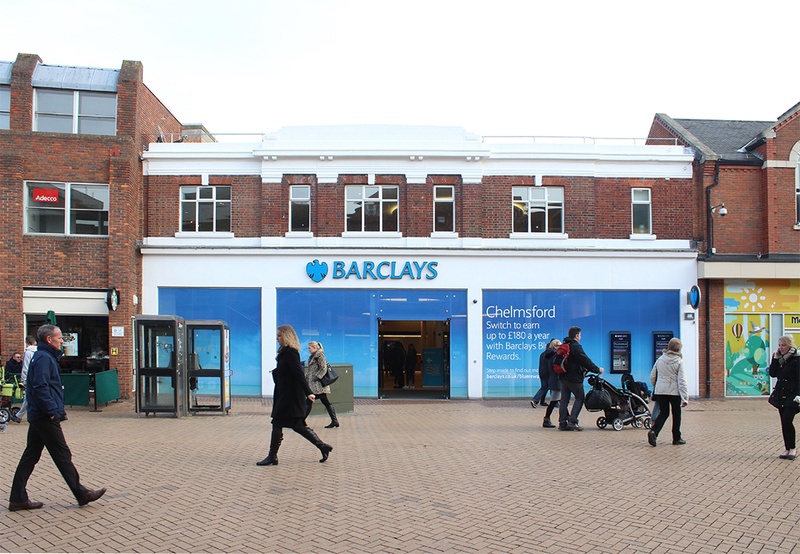 This extraordinary rate of growth was facilitated by the growing prosperity of the town and the increasing population in Chelmsford. 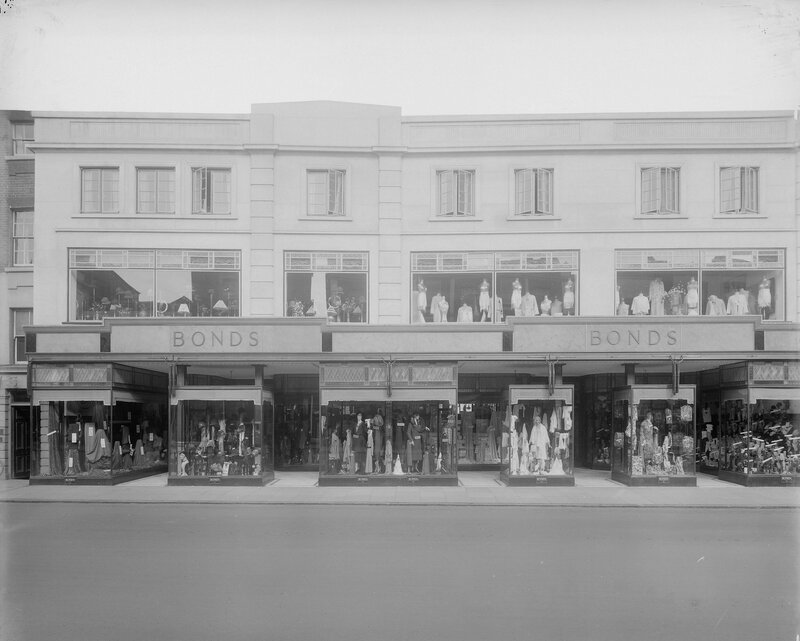 As the store grew, Bonds offered a wider range of merchandise which reflected the very latest trends and fashions. 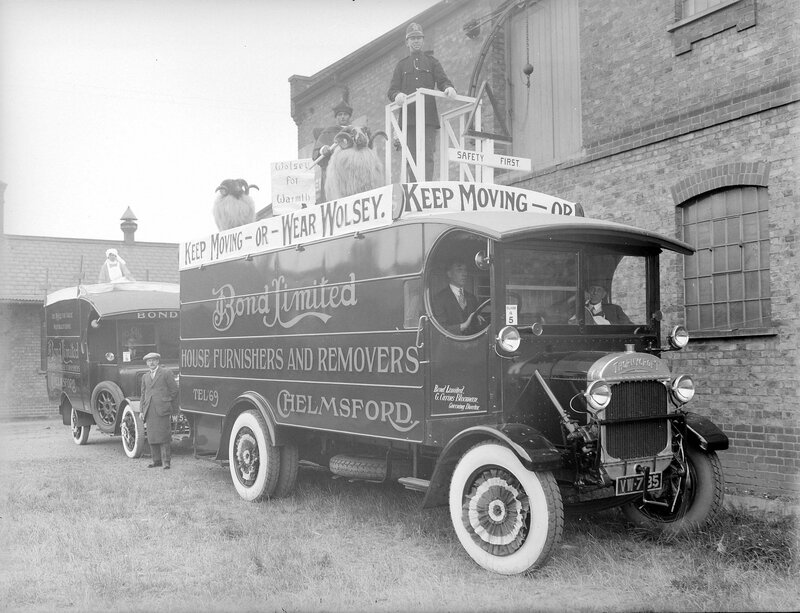 You can get it at Bond’s was pasted on the old steam buses and frequent advertisements appeared in the local newspapers announcing the arrival of new stock. Advertisement featured in the Chelmsford Chronicle announcing the arrival of the Summer season. J.G. 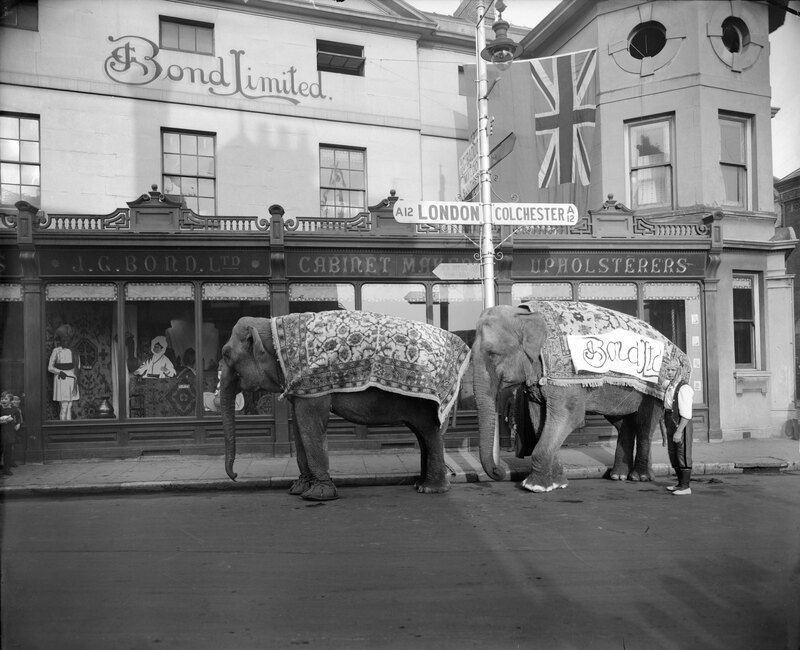 Bond’s van-dressing entry for the Chelmsford carnival of 1929. 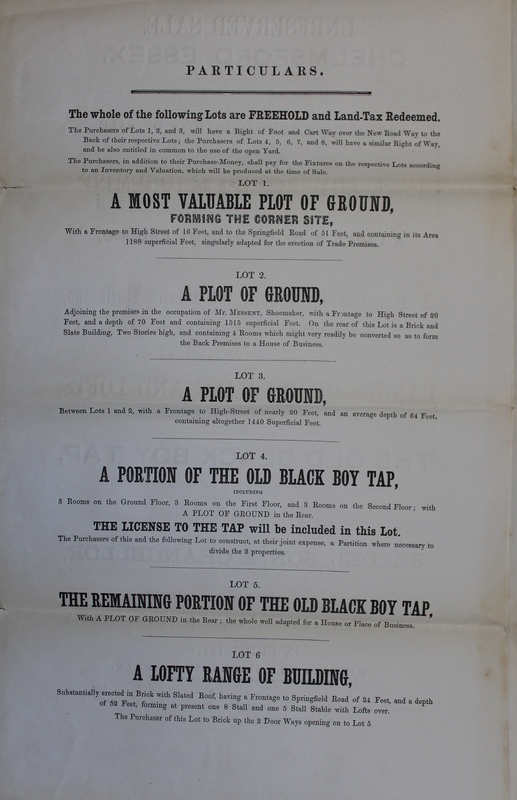 Bond recognised the importance of advertising and used the event as an opportunity to market his growing business. 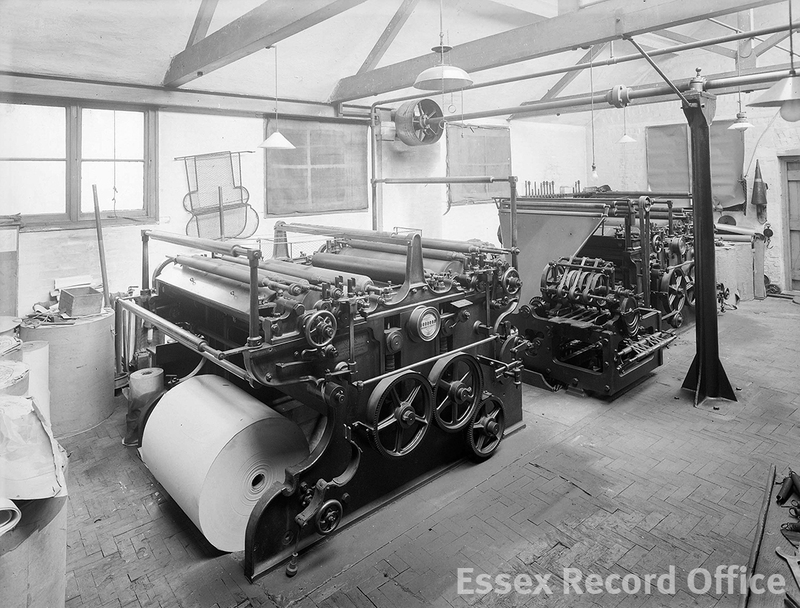 Advertisement featured in the Chelmsford Chronicle in the 1950s. 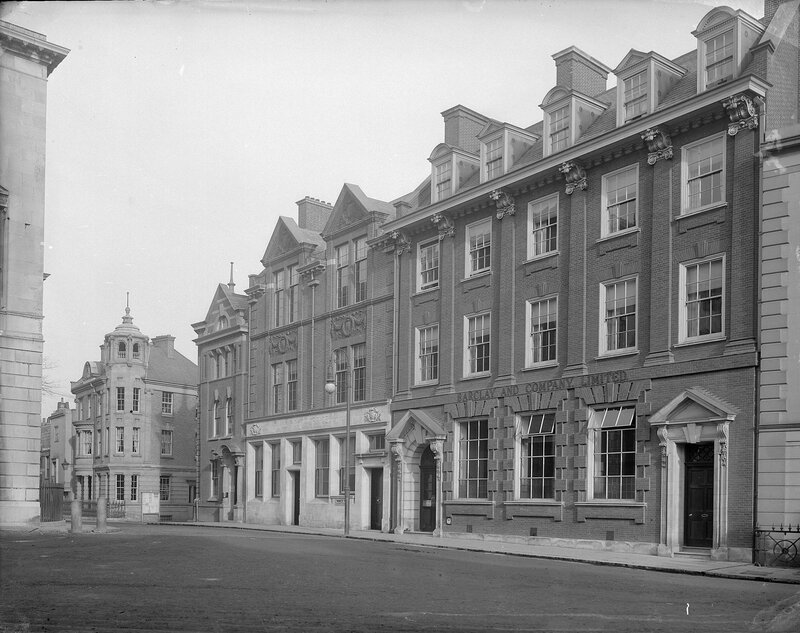 The Bond frontage dominated the east side of the high street for nearly a century. 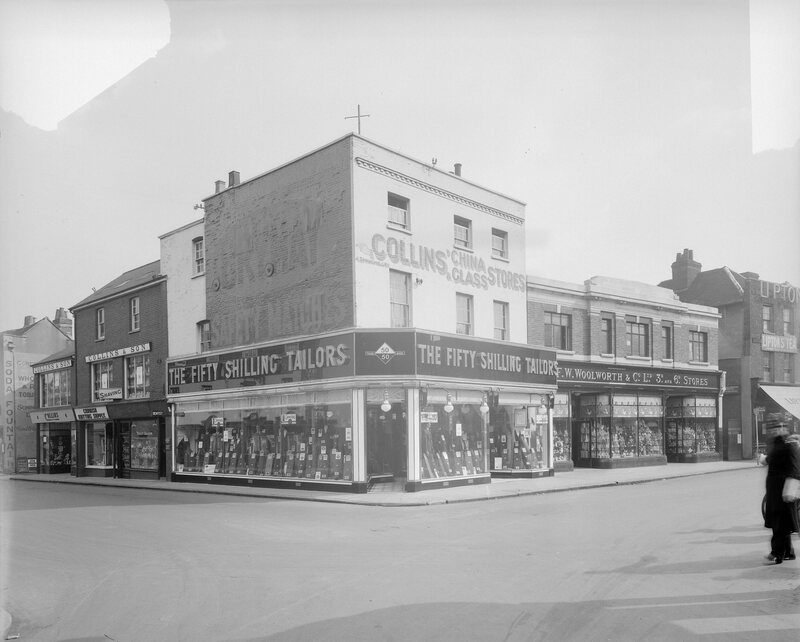 The photograph below, captured in the 1930s, gives a real sense of the shop’s size and its domineering presence on the east side of the high street. 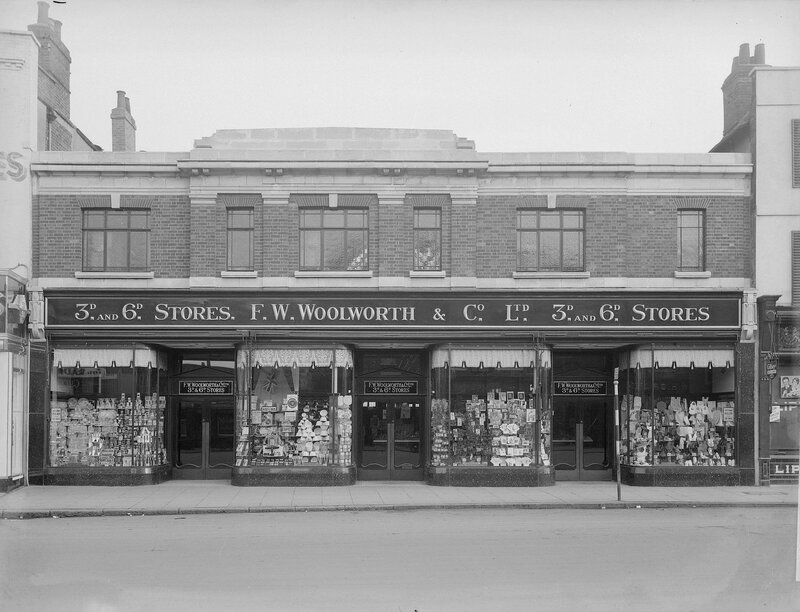 Two storeys of windows displayed the shop’s vast array of stock. 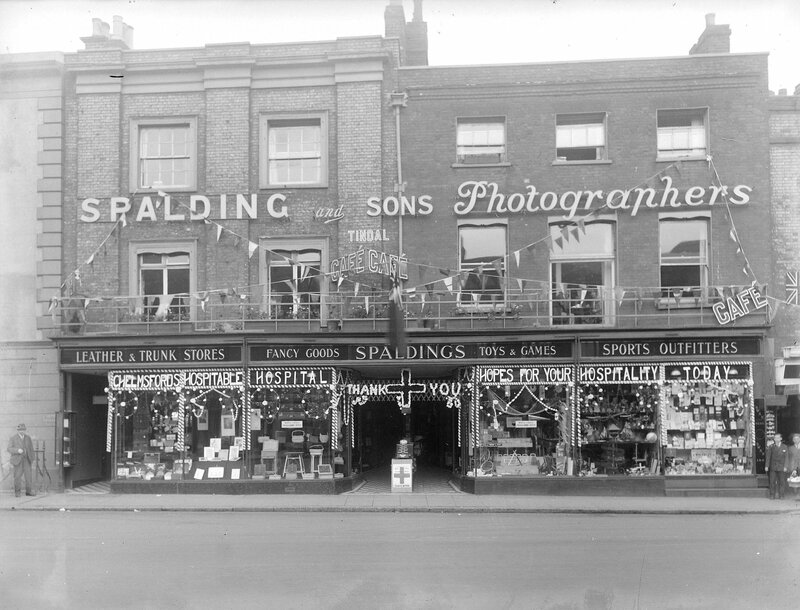 Spalding photograph of Bonds in the 1930s. 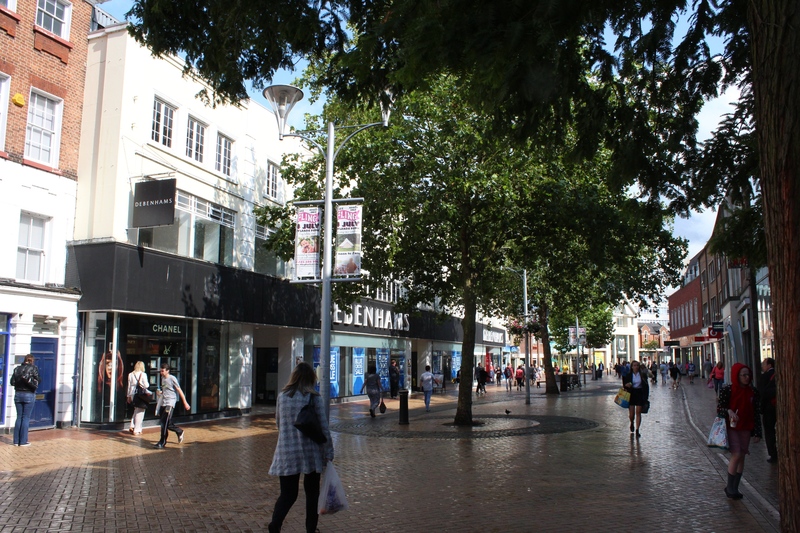 The store remained on the same site until the 1960s when it was purchased by Debenhams, who continue to occupy the same spot today. 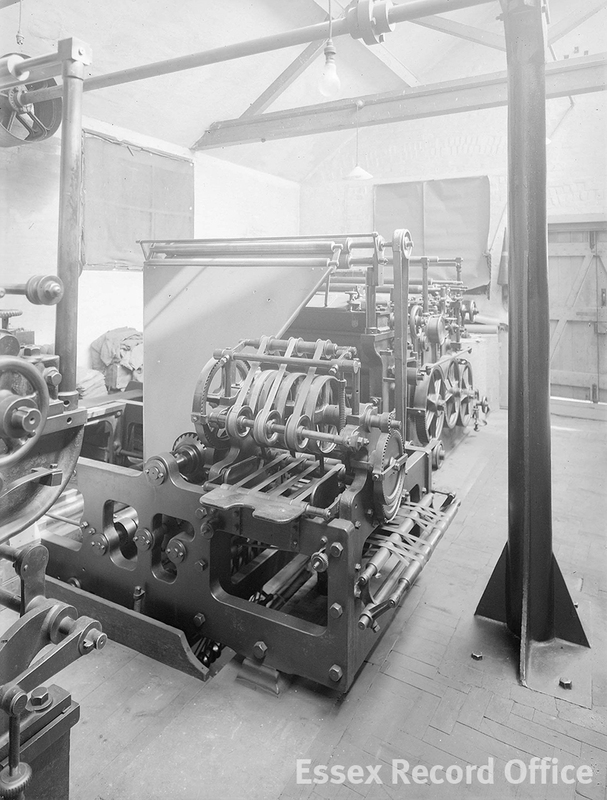 If you have ever visited and wondered why the internal layout is on different floor levels and is all a bit twisty, now you know – it’s because the layout of the site dates back to the medieval period. 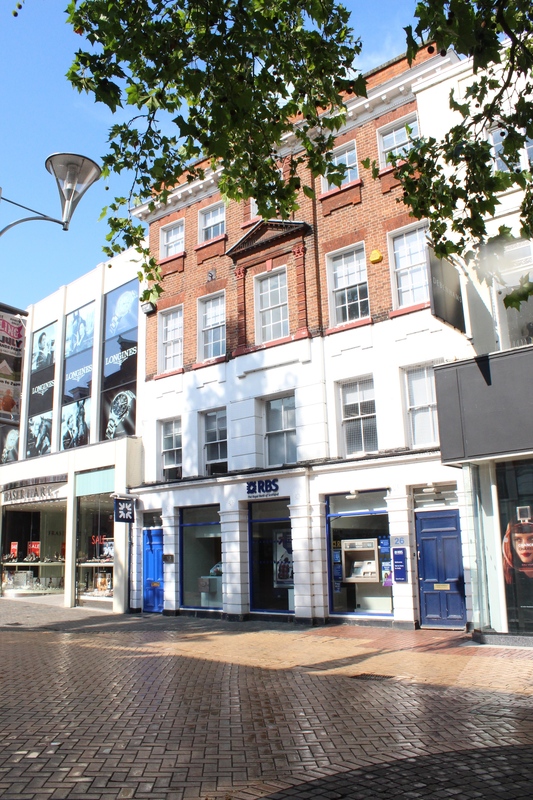 Debenhams, Chelmsford High Street 2015. 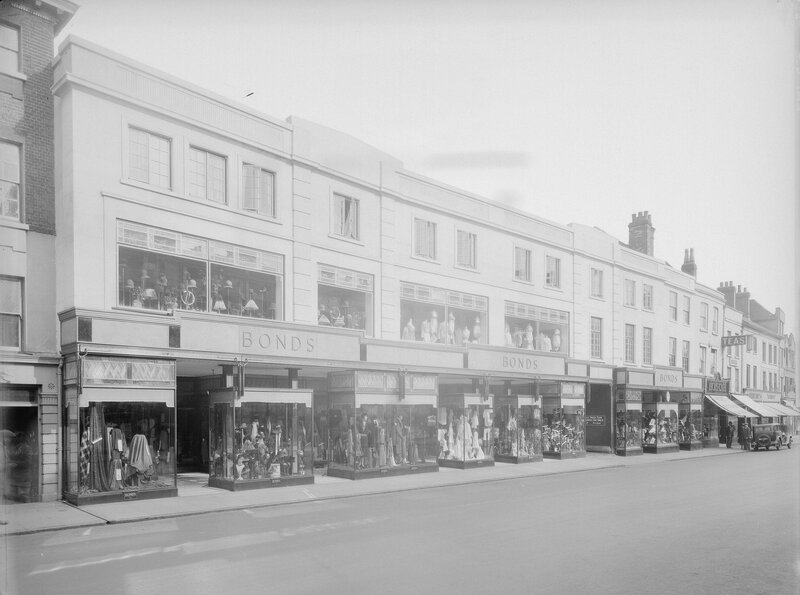 If you would like to find out more about J.G Bond or the Bond’s store see Hilda Grieve’s detailed history of Chelmsford The Sleepers and The Shadows. 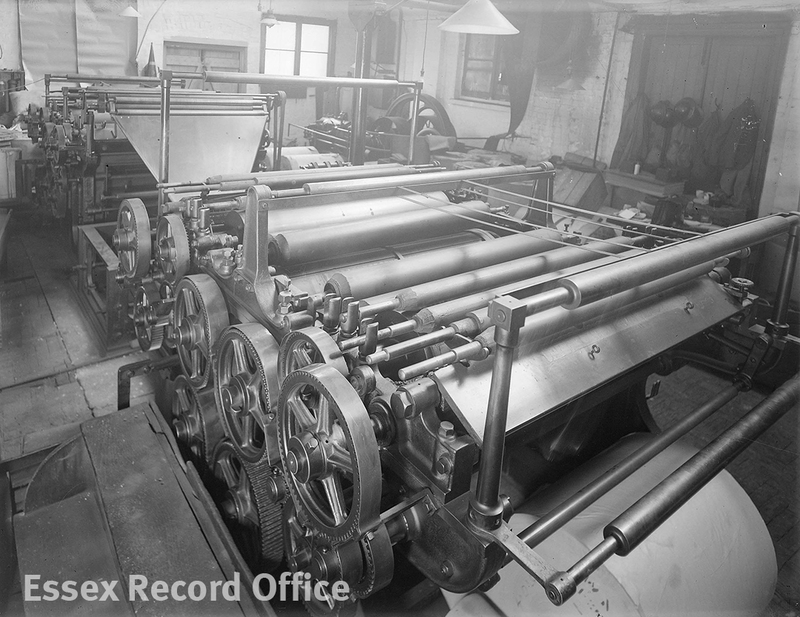 Alternatively search ‘Bonds’ in the British Newspaper Archive, available free from the ERO Searchroom, to view a wide range of the Bond advertisements. 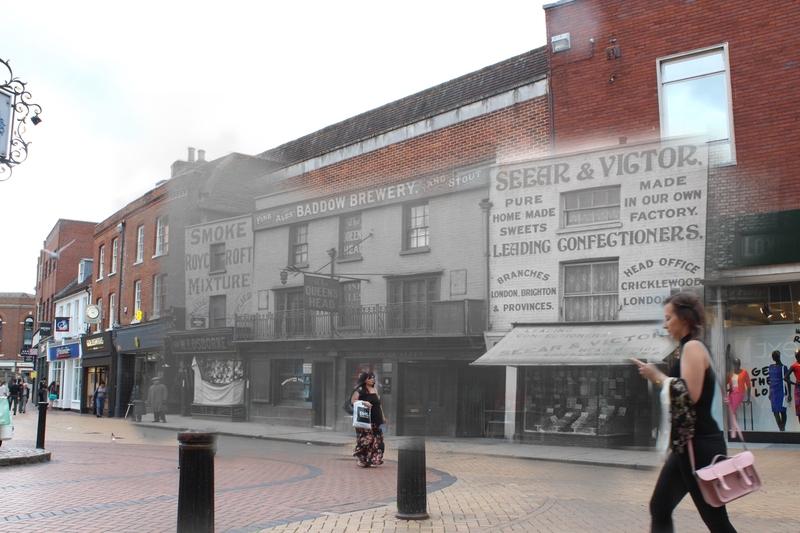 Immerse yourself in Chelmsford past in this display of maps, photographs, and sound and video recordings. 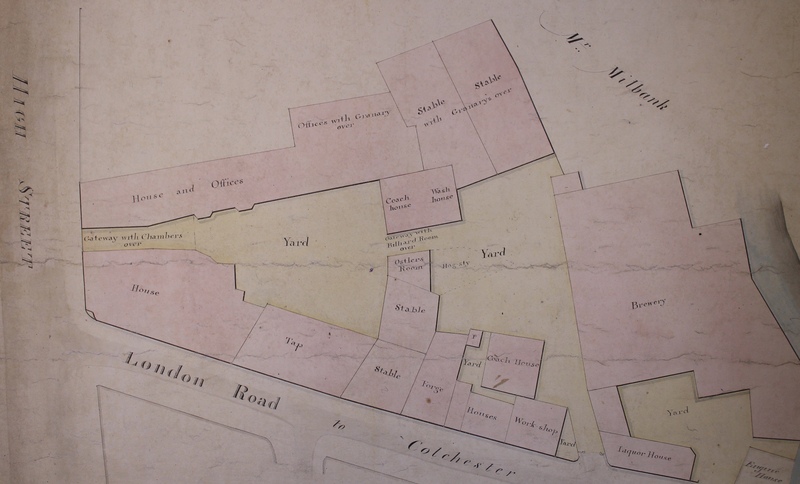 The Walker map of Chelmsford is one of the gems in the Record Office’s collections. 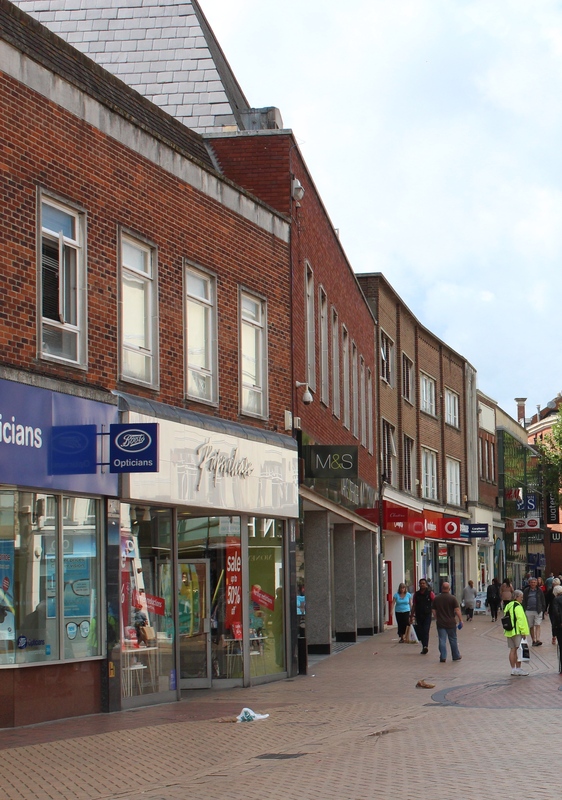 Using this as a starting point, we will uncover some of the secrets of Chelmsford High Street. The walk is on flat terrain and under one mile.